In 2016, Creative Victoria’s Creative State Strategy was released. An investment of $115 million was attached to strategy implementation. Victoria’s 47 public library services were not referenced in the Creative State document. Not one cent of the $115 million available to “put creativity at the heart of Victoria’s future” would go the the extensive cultural infrastructure and programs embodied in the state’s public library network. 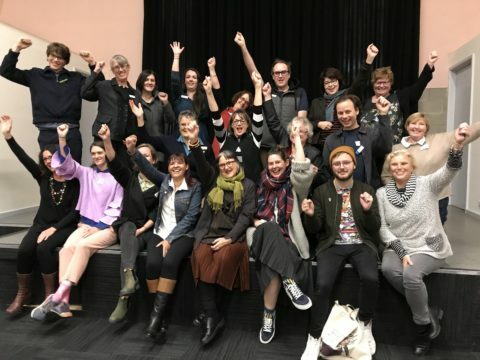 In 2018, Project Sisu worked with State Library Victoria and Public Libraries Victoria on The Creative Library, a series of workshops that were designed to untangle the various research reports – Creative Communities; Our Future, Our Skills; Victorian Public Libraries 2030 – with a view to developing practical advocacy frameworks, and a portfolio of skills and techniques to ensure public libraries are automatically included in Victoria’s broader creative ecology. Hopefully, the next Creative State Strategy will acknowledge and include the creative powerhouse represented by Victoria’s public library network. We worked with over 100 public library staff, from Woodend to Dandenong, including library leaders from across the state. We didn’t just want to talk about creativity, but actually BE creative. Thanks to Dr Sally Gray for co-design and co-facilitation; and to Debra Rosenfeldt, Jacqui Horwood, Robyn Ellard and the Library Sector Engagement Team at State Library Victoria. Here is a summary of the program.